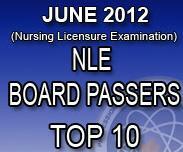 As of August 23 2012, The Official Professional Regulation Commission (PRC) has just release the top 10 June Nursing NLE Board Exam succesfull examinees with their names, schools, and corresponding average grades. And meanwhile it has been released the list of the successful examiners full and list of latest results of June 2012 Nurse Licensure Examination (NLE) that condducted last June to July 2012 Nursing (NLE) Board Exam by the the Board of Nursing (BoN). If you want the latest news and updates of list of successful examinees of June-July 2012 Nursing (NLE) Board Exam Results you can visit it from the official site of PRC, I would encourage you to go directly at the official website where the latest updates is. Top 10 successful examinees of NLE Nursing Board exam results together with their names, schools, and grades will be posted here since it takes a lot of page capacity when posting all names of succesful examinees when posting it here. But the all passers list will be link through pdf file but not directly posted in here. You can see it on the following texts. So if you want the file of all successful names of examinees you can download it through this official PRC page. That is a rar file and need to be extrated after the said download. Or If want a full names list of Nursing NLE board exam successful passers who are now a registered as nurses, so you can view this in pdf file but much credit on the official website. Please share this! Thanks. This last examination was taken on June to July 2012 has been on the PRC testing centers nationwide especially in the cities of Manila, Baguio, Cagayan de Oro, Cebu, Dagupan, Davao, Iloilo, La Union, Legazpi, Lucena, Cabanatuan, Pagadian, Pampanga, Tacloban, Tuguegarao and Zamboanga last June 30 - July 1, 2012. From a total of 60,895 Filipinos (Pinays and Pinoys) who took the exam only 27,823 examinees luckly passed it here in the Philippines. Congratulations to all board passers and for those who failed the exam, don't be discourage, better no luck but study very hard next time. Ok?